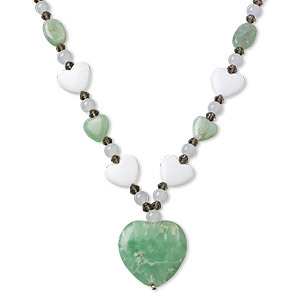 Necklace, autumn jasper (natural), 8mm round bead, 19 inches, B+ grade, Mohs hardness 6-1/2 to 7. Sold individually. 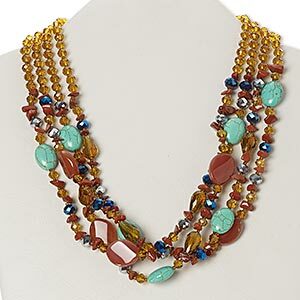 Opaque colors of brick red and avocado green in natural autumn jasper round beads. 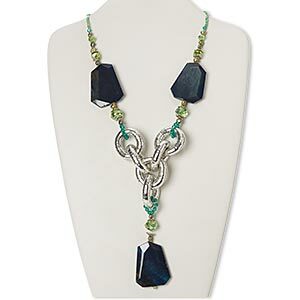 B+ grade, 8mm beads are sold per continuous 19-inch knotted necklace. 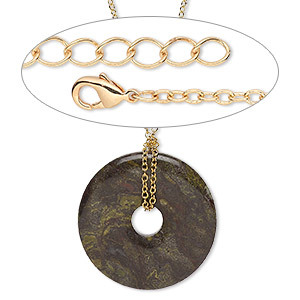 Necklace, Simple and Sleek Jewelry, dragon blood jasper (natural) and gold-finished brass, 50mm donut, 33 inches with 1-1/4 inch extender chain and lobster claw clasp. Sold individually. 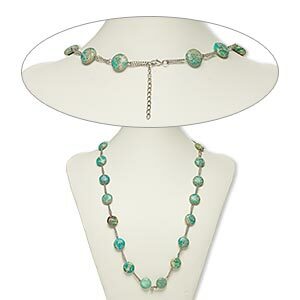 Necklace, cultured freshwater pearl / crackle agate (dyed / heated) / glass / silver-finished steel / gold-finished "pewter" (zinc-based alloy) / silver-plated brass, green and teal green, 5-inch dangle with 48x36mm faceted flat freeform, 27 inches with 2-inch extender chain and lobster claw clasp. Sold individually. 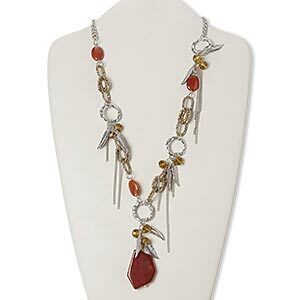 Necklace, red agate (dyed / heated) / glass / silver-coated plastic / silver-plated "pewter" (zinc-alloy based) / steel / brass, gold / brown / red, feather, 26 inches with 2-1/2 inch extender chain and lobster claw clasp. Sold individually. 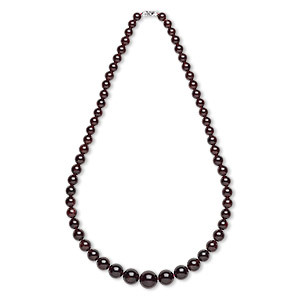 Necklace, garnet (dyed) and silver-finished brass, 7-15mm graduated round, 18 inches with barrel clasp. Sold individually. 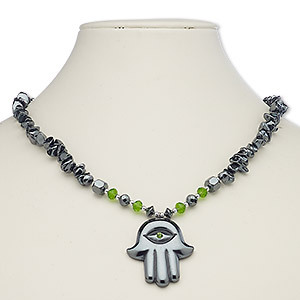 Necklace, Hemalyke (manmade) / glass / glass rhinestone / silver-plated steel / brass, green, 40x35mm Fatima hand, 18 inches with barrel clasp. Sold individually. 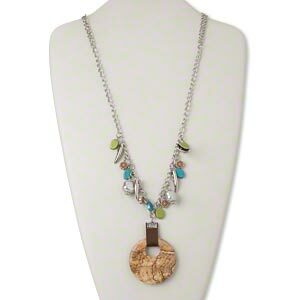 Necklace, carnelian / magnesite / red jasper (natural / dyed / stabilized / heated) / glass / silver-finished "pewter" (zinc-based alloy) / steel / silver-plated brass, multicolored, rondelle, 19 inches with 3-inch extender chain and lobster claw clasp. Sold individually.